Natalie is a very special doll made exclusively for us! Her green eyes and chocolate brown her are a stunning combination, complemented beautifully with the colours in her Liberty Art fabric dress. Ciao Bimba's Mini Darling dolls are made from the finest materials and take the longest to hand make. More about Natalie: Natalie is a beautiful cloth doll inspired by the Waldorf pedagogy whose teaching is that through sensory play a child becomes more imaginative, and even perceptive. The child develops those senses its experiencing, building the neurological pathways associated with each one. Children find sensory play therapeutic and even soothing. All the materials used in making Natalie are safe for children. Her skin layer is the finest jersey fabric. It's sourced from Switzerland, while the wool filling is sourced directly from local farmers in Bulgaria. The Mini Darlng dolls' hair is a mohair weft wig crocheted and then stitched into place on the doll's head. Natalie is firm but cannot stand up on her own, so if you wish to display her (if you can stop cuddling her for a moment) you are best to buy a doll display stand as well. Her head is sculpted using needle felting techniques which is how doll artists manage to create such a darling face. Waldorf dolls have mostly neutral faces so that a child can project its emotions on to the doll, so the doll might be happy or sad; laughing or crying. It's so important for a child to develop its imagination as it plays. The dolls are made by a trained team of doll makers at the Ciao Bimba workshop in Bulgaria's capital. The design is very special as it has been created by Waldorf doll artist, Maria Asenova. The Mini Darling doll Natalie comes with her own sweet gnome friend also made in the Waldorf style. Originally the Darling dolls were made taller and without toys. However, it was found that children managed best with the 40cm size - and loved the toys - so the Darling dolls have become Mini Darling dolls with their own toys! Why does it matter what exact materials are used? 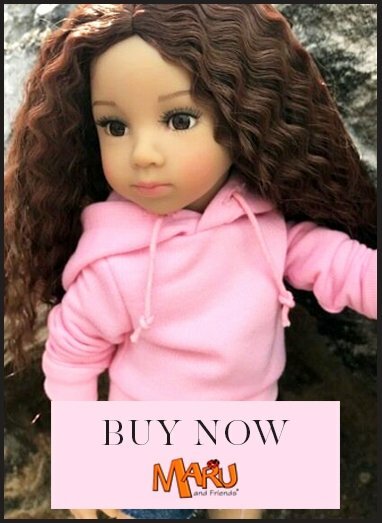 It matters to parents and grandparents to know that the doll that their child will cuddle up with at night is made from the finest natural materials. For those parents whose children have allergies, natural toys are especially important. For more about Ciao Bimba Waldorf style dolls take a look at the articles on our blog here.